Work has been really quite busy as of late. My boss thinks I know enough stuff to manage my own projects which is very different from the view of architecture I usually have… which is in essence draw and print. I have in the last few weeks been learning the differences and backing capabilities of carpet… experiencing meetings about wall hung toilets and drain pipes, answering engineers questions, measuring trelli (that is my plural of trellis, because I’m not a fan of the word trellises). Also today I had to tell a client that we’re running late on his new project because he keeps making changes to his old projects. In essence he back-burner-ed himself. As you can tell, I’m basically experiencing the most exciting thing architecture really has to offer you… which is work. 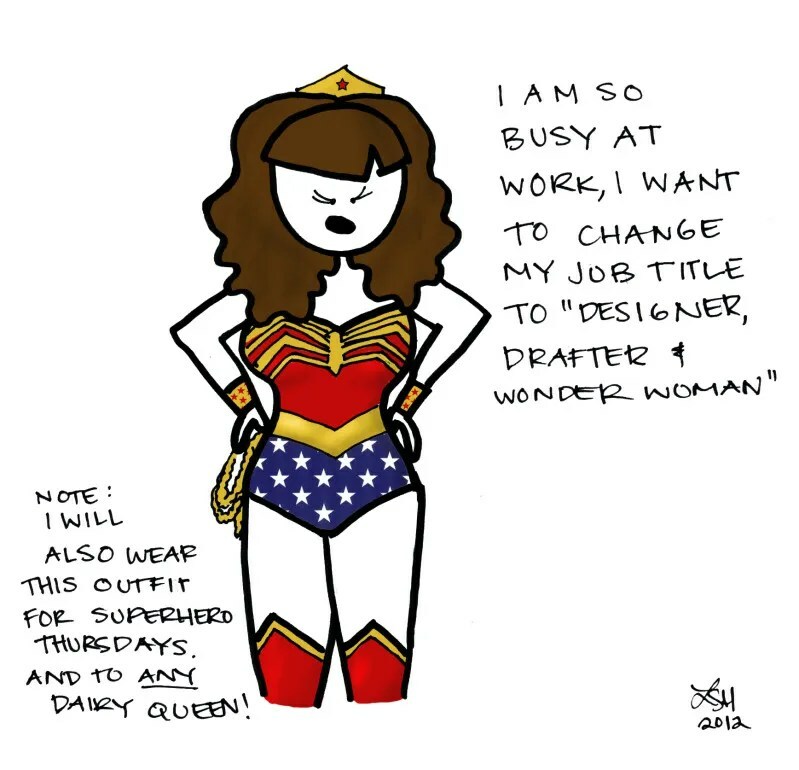 I bet you’ll make quite a fetching Wonder Woman! I’m trying to convince everyone I work with that we should dress like super heroes in the office. Wow it sounds quite frustrating but perhaps it means a potential promotion? Thanks Daperdolly! I think that the title of “Wonder Woman” is all the promotion I’ll get though.